Dr. Lewis and the staff at Order My Steps Podiatry recognize that foot & ankle pain affect the quality of life and mobility of many people. Therefore, we are committed to providing you with excellence in podiatry care and treatment. We’ve assembled a fantastic TEAM to help you with your needs before, during, and after your visit. Feel free to ask any questions or let us know what you need. Your healthcare is paramount. 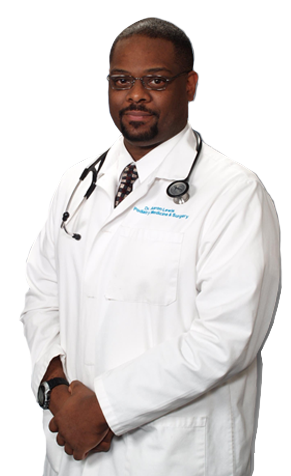 Dr. Aaron S. Lewis is a native of St. Louis, MO, and has been in the Maryland area since 2007, beginning his practice Order My Steps Podiatry in Baltimore, MD. He is a graduate of Prairie View A&M, TX and New York College of Podiatric Medicine, NY. After graduating from New York College of Podiatric Medicine he completed four years of residency in Podiatric Medicine and Surgery, and served as Chief Resident for one year. Most of his training was completed in New York City, which gave him the opportunity to treat a variety of foot ailments. Dr. Lewis has been trained in the diagnosis and treatment of a variety of foot conditions. His training encompasses all the intricately related systems and structures of the foot and lower leg including neurological, circulatory, skin, and the musculoskeletal system, which includes bones, joints, ligaments, tendons, and muscles. Dr. Aaron Lewis has experience in wound care, surgery, diabetic foot treatment, podopediatrics (Podiatry for Children), sports medicine and many other specialties of podiatry. Although Dr. Lewis is skilled in surgery, he is equally skilled in non-surgical treatments. Dr. Lewis is compassionate and respects his patient’s individuality, taking the time to understand them and designing a treatment plan that meets their unique needs and challenges.